The "battle hover" pose is mostly based on the fighting pose from the classic Taito Superman arcade game. I chose that pose because 2013 isn't just the 75th anniversary of Superman's first appearance AND the 25th anniversary of that Taito game hitting arcades. 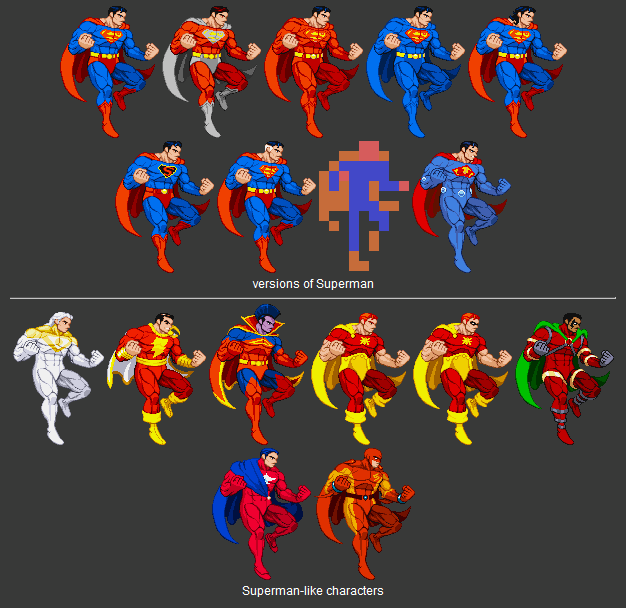 The red-and-gray version is the unnamed second player's palette-swapped Superman from that game (and he has the slightly different hairstyle based on the lifebar portrait from that game). The orange-and-red masked character is Sunman, a Superman stand-in for an unreleased Sunsoft game for the NES. Both the Superman game and Sunman prototypes were recently found and turned out to be amazingly good. The blocky sprite is based on the Atari 2600 game that I played the heck out of as a kid.